Have you dreamt about being your own boss? You may have reached a point in your life that you want to do something different? You want to be answerable to yourself. You have heard of many stories by successful entrepreneurs and aspire to be in their footsteps. Ernest Liew, like many of us, have been working hard since he joined the marketplace. Having work in the telecommunication industry for more than 10 years, it seems daunting to step away from his core competency to set up his own business. Only a few would dare to try. However, Ernest is no stranger to the F&B industry as he has always shown great interests in food and café lifestyle. A Christian and worship leader back in his hometown church, Ernest shares on what it takes to be an entrepreneur and the challenges which aspiring business owners need to face in a start-up. The reality. KKI: Share with us what you did in the past and how did the idea for setting an F&B business came about? EL: I was in the telecommunications industry for 15 years and always had the ambition to start something on my own. I also enjoy food and the café lifestyle. So with some savings I decided to delve into the F&B industry and learn from an existing franchise system. I took time to scout the many franchises available out there before deciding on the path to take. KKI: It has never been easy to be an entrepreneur. What are some of the challenges you faced and what have you learned from them? EL: The most challenging experience in the last few months has been managing staff. Your staff are your revenue generators and they form one of the key pillars of your business, particularly in F&B. How much revenue the business makes depends on their speed in taking and churning out the orders and how well you retain customers depend on the quality and consistency of your service. As humans there are certainly inconsistencies in our performance, so there lies the challenge of getting them to see the impact of their performance on the business and motivating them to keep achieving and improving. It’s imperative to manage this well or it will impact your revenues. KKI: Now that your business is on-going, what are your plans to retain and attract more customers? EL: We need to continue keeping the level of service high – providing consistent quality of products and service at all times. Being located in the CBD, we serve the office crowd, so speed is one of the key elements of success. We need to serve our customers fast and at the same time with a good level of consistency in the quality of our beverages. When customers get what they expect, they will likely return. Price is also a key factor in attracting and maintaining customers. The lunch crowd is generally quite price sensitive. As such, we ensure that our pricing is competitive and affordable. We also try to attract more diners with a pre-lunch promotion from 11am – 12pm where for only $5 you get a meal and drink. 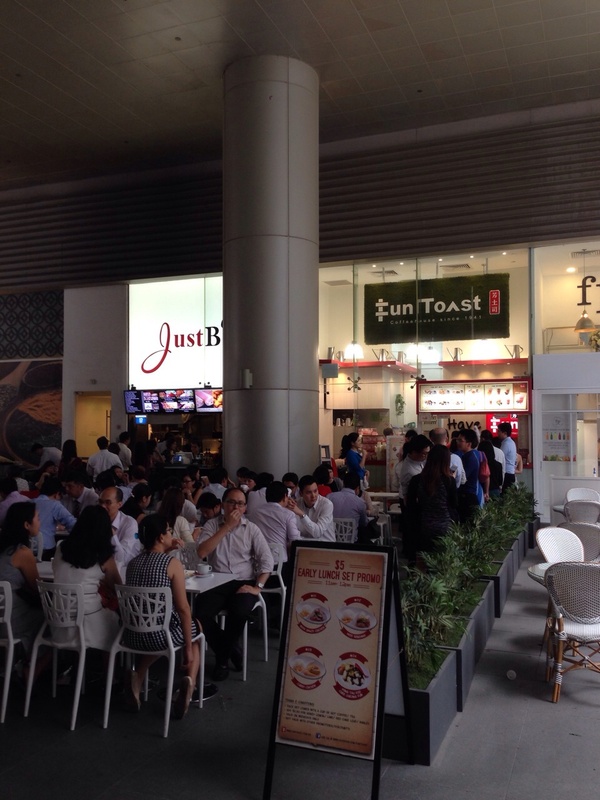 It gets very crowded during lunch hour in the CBD and there are customers who go for early lunches to avoid the crowds. Our pre-lunch promotions are targeted at these groups of people who get the best bargains. KKI: Can you describe your typical day at work? EL: My first 3 months were focused on learning up the business and I was hands-on in playing nearly every role in the shop. With that my day would start at 5am when I would wake up, get ready and head to the shop. I start preparation with the team before 7am and by 7.30am we start serving the early customers. Now I just go in during the busy lunch hour to help serve food. This only supports my team with extra hands, but also gives me the opportunity to meet some regular customers. The crowd is strong in the mornings before work and also during lunch. Then we serve the tea time crowd from 4pm onwards. By 5.30pm most of the office crowd would have headed home. The shop closes at 6pm and by 6.30pm after all the cleaning and preparation for the following day, we head home. KKI: What are some challenges you faced in staff recruitment, if any? EL: It’s definitely a challenge to hire the right people for the job. It is a fast-paced environment and requires an early morning start. The hours are long and it can be physically taxing. So it’s not appropriate for those seeking slower paced employment. But, unlike most cafés we are open only five days a week. So it’s ideal for those who prefer to work hard during the weekdays and have the weekends all to themselves. KKI: Being a business owner, can you share what is good staff management is like? EL: Everyone has their needs and their ups and downs. With various backgrounds and different mindsets, there are different levels of commitment to the job. Managing them well is to be able to consolidate all these differences, see the good side in each of them and constantly draw on their strengths. If there is a need for reprove, a good manager helps the staff understand not only where he or she has gone wrong, but also how his or her actions impact the rest of the team – all done in a very appropriate and encouraging manner to motivate the staff to improve. Having been an employee myself, I believe everyone appreciates a comfortable working environment, seeks to be valued, respected and should be treated well for a job well done. If we do these well, they are likely to work with you for a longer term. KKI: What do you feel is the major difference between working for someone else and being a business owner? EL: As a business owner, you have the privilege to establish the culture and values of the workplace. You can determine what should be tolerated and what shouldn’t be. The mindset is a 180 degree change from an employee’s mindset – you need to make things happen, not pass the buck around. At the end of the day, how well you perform will reflect in your profit and loss and whether you’ve made good on your hard earned capital invested. So your interest in the whole venture is multiplied many more times as compared to working for someone else. KKI: Apart from being a business owner, what are your hobbies? EL: I play tennis and do a bit of running. KKI: Being a Christian, share with us how do you apply the biblical values in running the business? EL: Integrity, accountability and excellence are very important biblical values which I instill as a workplace culture. I want to run an honest business and do things well. This applies to all aspects of the business from delivery of product and service to dealings with people – suppliers, customers, staff, etc. In relating with people, I always try to apply a certain level of graciousness. I listen to customer’s feedback with regard and treat all my staff with respect. I am kind to them but at the same time stern when improvements need to be made. Mistakes are a natural part of growth but only if you learn from them and continuously improve. KKI: What advices would you give to aspiring people who want to become entrepreneurs? EL: Count the cost, really understand the commitment involved and what you are going into, talk to people in the industry, learn from their mistakes. Be humble to keep learning and keep improving. KKI: Lastly, can you share with our readers of the opening hours and location of your café? EL: We are located at One Shenton Way, just beside Asia Square. We’re opened Monday to Friday 7.30am till 6pm.